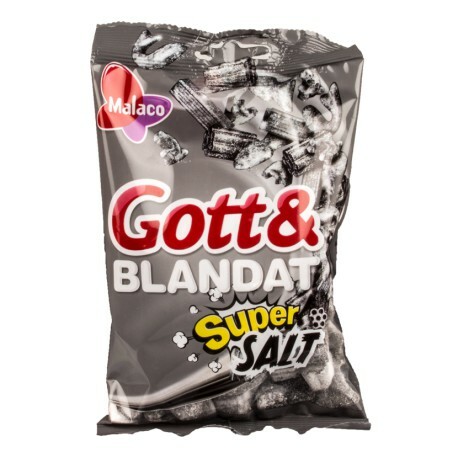 Gott & Blandat Super Salt 130g is a perfect mix of our favorite super salty candies! Having trouble coming up with topics for conversation? Open a bag of Super Salt and a case of beer. It's party time! Gott & Blandat Super Salt 130g Swedish candy is always fresh, salty, and priced right at SnusCentral.com! There is no tobacco in any of our yummy Swedish candy. Buy snus from our huge, fresh Swedish snus selection if you are looking for tobacco! Extremely salty, like a teaspoon of table salt poured into your mouth. Extreme licorice flavor, so strong it's right at the edge of burning. My German wife loves them.